Today I write to you from one of my favorite, most inspirational locations, coastal Maine. I have always been fond of the ocean, although not being in the ocean, but being near it. The sound of the surf, the lighthouses, the happy puffins, and today, the way the striated clouds parallel the horizon, makes me quite content. I find inspiration here, in this setting, even though the wind makes my cheeks frozen and numb. What is it about the ocean, specifically Maine? Back in 1990, I flew with my friend Jenny to Spain, and spent a few weeks living with a family which we had met when their daughter was an exchange student at our high school. It was our first transatlantic flight, one where we would actually need a passport, and we were all of nineteen years old. On the return flight, our plane made a surprise stop in Bangor, Maine, at which time I viewed for the first time the beautiful, lake-filled, ocean-coasted landscape of that state from the window of our plane. At that moment, I made a pact with myself that I would be sure to visit and spend quality time in Maine. Nowadays, my husband and I make at least one yearly trip to Maine. During that time, we visit familiar and unfamiliar places. I draw much inspiration from the sea and the surf here. On one visit, we saw some beautiful harbor bells for sale. These multi-toned bells are crafted to mimic the unique harbor bell tones of the various harbors on the coast. We purchased three different bells that visit, each representing the bell tones from different places: Cape Cod, Chesapeake, and Portsmouth. Each sounds different, and each represents both a lonely and uplifting spirit. Here are some sound samples. What do you think? I learned from the vendor that all buoy bells are different, each one a unique combination of tones, distinguishing it from the bells of other harbors. I have also since learned that there is a long history of these bells in Europe as well. We ended up keeping the Portsmouth buoy bell, and gifting the others to our parents. We leave our bell up year round on our front porch. Even the smallest breeze sends the mournful, yet hopeful tones through the air. We love its sound. An old man, with skin transparent enough to see the veins and sinews beneath, sat on a stump. Mangled and contorted, his bony fingers grasped a walking stick, gnarled with knots of the tree from whence it came. His knuckles, enlarged and swollen with age, protruded profoundly, threatening to burst through the very skin that was holding his aged body together. Around his shoulders, a cape, threadbare from time and wear, fluttered as a breeze floated past. In the distance, a harbor bell sounded. Its three-toned broken chord, resonated within James. It was a familiar sound. One that he had been around his entire life in coastal England. Today, though, the bell’s music felt somewhat different. As if a trance threatened to overtake him, James stood, looking intently at the caped man. He was captivated. I hung up my Music Teacher Hat last week so I could celebrate the holidays with my family and friends. Along with that, my family is blessed with both of my children’s birthdays during this week as well (December 27 and 29), making this week, for them, the gift that keeps on giving. I love it! In the quiet times of this vacation, though, I get to reflect on the year which has passed, and lay down some plans for the the coming year. 2016 brought with it the loss of many familiar people in our lives.I write about the loss of David Bowie here, but we said goodbye to so many other public figures in 2016 as well. One loss of a very personal nature was Great Grandfather Dede, who was a World War II veteran. A couple of years ago, he took part in the Honor Flight, which was such an emotional experience for both him and us. His burial was incredibly moving. 2016 brought with it some fantastic writerly news, as I landed a publishing contract with REUTS Publications, began an internship with Golden Wheat Literary, and signed with agent Jessica Schmeidler, who is representing my writerly works. I also worked along side a screenwriter to adapt one of my novels, which was as fabulous as it sounds! Here is my adrenaline-charged post about that. Finally, after struggling with a work in progress that seemed to be too much to handle, I had an epiphany, and mapped out the story as a trilogy, of which the first draft of Book One (The First Harbor Bell) is two-thirds complete. I am super proud of that, as it is a story that has been brewing within me for at least five years, and whose initial seeds were planted when I was only fifteen. I can’t wait to share The Harbor Bell Series with you! As I roll into 2017, I have three resolutions. I hope to continue the trajectory I am on with my writing. I am on a serious roll with The Harbor Bell Series, as well as a couple of other things, and I resolve to continue my forward-moving progress on those fronts. I resolve to stay “above the line” as much as possible, in all aspects of my life, writing or otherwise. For those who may not understand what that phrase means to me, here it is: “Above The Line” means to focus on the positives in life, and to be the change I want to see. Dwelling on the negatives is destructive, and I don’t have time for that. I resolve to get back on my weekly blog-posting schedule. It’s very doable, and I miss it. Along with that, I further resolve to let go of any guilt quickly when life happens and I might not be able to post on that schedule for a time. Things happen, and it’s not the end of the world. So, there you have it. Wish me luck, but I know I can do it! What are your thoughts as we leave 2016 and head into 2017? Post your comments here! Hello, readers! Welcome to Autumn! With school in full swing now, and October on the horizon, my daughter has been asking about costumes. I am now searching online daily for the exact costume she wants. We will find it…eventually. I only hope that when we do, it’ll arrive on time. When I was younger, I remember dressing up as a 50’s girl, with a poodle skirt and bobbie socks. As I got older, we would have school dances where we could show up in costume, which one time, I dressed up as Cyndi Lauper. Hey! It was the 80’s, and for the record, I also had a Cyndi Lauper birthday cake that year. This post, so far, has been a trip down memory lane. You might be surprised, though, because here comes my writerly tie in: The act of writing fiction is like creating a costume, and the act of reading fiction gives you a new costume to wear for a short time. Here’s why: Fabulous words, draped over the body of reality, allow the reader to experience life as someone else for a bit. It’s a beautiful thing. As kids, how many of us identified with a hero or heroine, choosing to read books about those characters so that we could continue to experience that life a while longer? Some of my favorite books as a small child, were created by Beatrix Potter. I loved the costume-like world she created for her animals, and reading these books together with my parents ad my grandma Honey placed me directly into Peter Rabbit’s thicket, Hunca-Munca’s dollhouse, and Squirrel Nutkin’s tree. As I grew older, I found that I wanted to spend more and more time with the characters of Judy Blume, Madeleine L’Engle, and Jean Shepard, among others. Opening a book was as if I threw on a costume, becoming part of those character’s world. I am grateful that I had the experience of wearing those literary costumes growing up, and I consider myself fortunate to have the opportunity to create costumes for my readers. It’s a wonderful thing. What literary “costumes” were your favorites growing up? How about now? If you are a writer, what “costumes” do you create for your readers? Please share your comments! I love hearing from you! P.S. In case you have now been inspired to watch Bruce Springsteen’s epic video for Dancing In The Dark, here it is! Enjoy! Happy New Year! While this post is happening a little bit later than I wanted, the sentiment is the same. With the passing of the 2015 holiday season, I am poised to reflect on something wonderful; a gift that I received from my mother. I hope that reading this will give you a warm feeling on these cold winter days. One of the fondest memories I have from my youth is baking with my mother. Mom was a first grade teacher for many years, and her attention to details is what made her a fine baker. I mention this, because several years ago at the holidays, my mom presented me with a book she had put together; a journal of sorts, or perhaps more of a scrapbook, which was filled with stories, cookie recipes and pictures. The stories told about my female relatives and their Italian heritage. Each story was adorned by a photograph of the relative whose recipe it was. These were special cookie recipes. I knew the cookies were Italian in origin, but these particular recipes held a special place in my mother’s heart. She had enjoyed baking cookies with her own mother (my Nana), just as I had enjoyed baking with mine. I had grown up making the same cookies with my mother in our kitchen, but I hadn’t realized from whom the recipes came. My mother added her own special holiday cookie recipes as well, making the book something of a time capsule. A photograph of my great grandmother, Nana’s mother, with a favorite of her recipes sits on the final page of the book. That is so special to me. The photo is very old and faded, her wavy silver hair apparent. Clearly, Nana learned to bake special cookies from her mother. It’s a family tradition worth keeping, and I intend to add a page with my own photo and recipes into the book as well, so it may be passed on. So there you have it; a bit of a sentimental journey, but a fond one, nonetheless. Does your family have any special holiday baking traditions? Are there family recipes that hold sentimental value to you? I’d love to hear from you in the comments! Episode 7 of a series that pervaded my thoughts as a child. I was six when A New Hope was released. I remember it so clearly. My parents had gone out with friends to see it in the theater. The next morning, they told me all about it, and said they would take me to see it the next day. I didn’t know what Star Wars was, but they assured me that my cousin Dave and I would love it. Hey, any time I got to go to the movies as a kid was awesome. We piled into the car the next afternoon to see a Star Wars matinee at the Twin Cinemas. After we got our popcorn and waited for the previews to be over, it began. The music: Captivating. The opening text disappearing into the galaxy with words that I was too young to read and understand fast enough: Somehow perfect. It didn’t matter that I couldn’t read it though, because within the first two minutes, I was already hooked. Droids, battles, a handsome kid, a beautiful princess, a sarcastic space cowboy. To me, that six-year-old kid who knew nothing of the story prior, this film became my world. My cousins and I (I have no siblings) would act out Star Wars scenes every chance we got. We dreamed about wielding light saber’s and using the Force to move objects. I wanted to own a Millennium Falcon toy in the worst way. This was a franchise which defined many a childhood. I know I wasn’t alone in that sentiment. I had comic books, trading cards, coloring books, posters, figurines, etc. I couldn’t get enough. Neither could my friends. And did I mention the music??? When I was ten, Empire was released (my favorite!). I had records of John Williams magnificent score, and my friend and I would listen for hours. We were budding musicians at the time, and we would hack away at learning to play the melodies to the Imperial March and Yoda’s Theme by ear. Today there are all kinds of digitally downloadable versions of film music to play, but back then, it was near impossible. Good times! As I reminisce about “growing up Star Wars”, I am faced with the release of Episode 7. I have avoided reading too much about it, because, if possible, I want to experience this with young eyes again. The fact that the original stars are featured makes me giddy enough! Who’s with me? What are you most excited about with the release of The Force Awakens? Did any of you “Grow Up Star Wars”? Let me know in the comments! I’ve Got a CoverTo Reveal…Who’s Curious??? No…The picture above isn’t the cover being revealed today, but I hope it got you all curious. Today’s cover is for the 2014 Project REUTSway anthology, and it looks nothing like the question mark above. 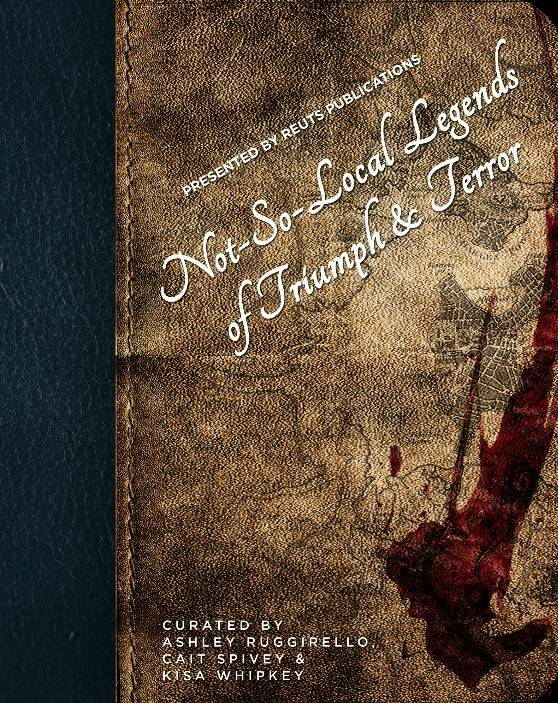 The title of this years Project REUTSway anthology is Not-So-Local Legends of Triumph & Terror. I am really excited about this particular anthology, because I have personally read works by a few of the contributing authors, and I can tell you that this anthology is sure to please!